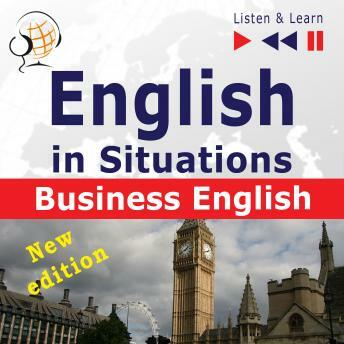 Listen to "English in Situations: Business English - New Edition (16 Topics - Proficiency level: B2 - Listen & Learn)" on your iOS and Android device. Listen to English in Situations. Business English - New Edition". This audio course at intermediate level masters the conversational skills required to communicate freely in the office, when seeking new employment or travelling on a business trip. Each lesson presents a new subject of typical conversations and teaches how to form sentences independently.  finally answer questions and independently form sentences following the teacher's instructions. In the new edition of the course, you will find a new part teaching useful expressions used in discussions. This is effective learning, easy and accessible to everyone. E-book (PDF file) - the texts of all the recordings: dialogues and exercises with answers. In addition, there is a Glossary to each lesson including the more difficult words and phrases translated into: French, German, Italian, Japanese, Polish, Russian, Spanish and Chinese.